WHO PUMPED MILLIONS OF GALLONS OF WATER DURING CALIFORNIA’S DROUGHT? | "Global Possibilities"
Home » Water » WHO PUMPED MILLIONS OF GALLONS OF WATER DURING CALIFORNIA’S DROUGHT? WHO PUMPED MILLIONS OF GALLONS OF WATER DURING CALIFORNIA’S DROUGHT? This story was originally published by Reveal and is reproduced here as part of the Climate Desk collaboration. The city said naming water-wasting customers wasn’t in the public interest, even after Reveal found last fall from The Center for Investigative Reporting that 100 residents of wealthy neighborhoods on the Westside of L.A. were pumping millions of gallons of water apiece, drought or no. And one household in Bel Air was using enough water for 90 families. So we decided to figure it out ourselves. The hard way. Using satellite images, an algorithm developed to track drought and deforestation, and equations used in landscape planning, we identified seven of the most likely culprits. Call these mega-water users Bel Air’s wet princes and princesses. The estimates aren’t precise enough to pinpoint one specific estate as the worst. But, not surprising considering the neighborhood, this thirsty group includes some of the wealthiest people in L.A., and they live in some of the city’s most expensive homes. Their collective offenses on the water-guzzling front: fountains, swimming pools, an artificial waterfall, acres of lawn, subtropical landscaping, thousands of flowers, dozens of bathrooms. The mega-users broke no laws, because the city’s Department of Water and Power allows ratepayers to pump as much water as they can pay for. But a new state law will subject mega-water users to hefty fines in future drought emergencies. Former Univision CEO Jerrold Perenchio, owner of the 42-room French-style chateau from TV’s The Beverly Hillbillies. His compound of lawns, formal gardens, woodlands, and vineyards would require at least 6.1 million gallons of water per year. Investment banker and onetime telecommunications tycoon Gary Winnick, owner of the 28,000-square-foot “Bellagio House” near the Bel-Air Country Club. The grounds, famous for floral gardens, require at least 4.6 million gallons per year. Movie producer Peter Guber, who is also part-owner of the Golden State Warriors and the Los Angeles Dodgers. His wooded estate on a ridge above the Hotel Bel-Air needs at least 2.8 million gallons per year. And soap opera producer Bradley Bell and his wife, U.S. Ambassador to Hungary Colleen Bell, at least 2 million. Most of the mega-users declined to comment or failed to respond. But two acknowledged their high use and said they were trying to do better. Daly said that since 2014, he had cut water use by 35 percent on his estate, tearing out lawns and employing other conservation measures. “I am very conscious of it,” he said of his water use. After receiving our email, Alagem, the hotel owner, hired a landscaping company to reduce water usage significantly, said spokesperson Marie Garvey. Owner: Trusts controlled by Jerrold Perenchio, who is among L.A.’s wealthiest men and biggest political contributors. A onetime Hollywood talent agent, he produced hit movies (Blade Runner) and television shows (All in the Family), then built Spanish-language Univision into the nation’s fifth-largest TV network. Today he is worth $2.7 billion, according to Forbes magazine. Public records show Perenchio has made more than $45 million in political donations, giving millions to California governors Gray Davis and Arnold Schwarzenegger and to Republican Party strategist Karl Rove’s PAC. Recently, he gave more than $2 million to a super PAC supporting Republican presidential candidate Carly Fiorina. House: The 21,500-square-foot French-style chateau has 10 bedrooms and 12 baths, according to the Zillow real estate website. Beneath it is an “underground motor court” for 30 cars, according to the Los Angeles Times. The mansion’s compound contains a helipad and several other homes, one with four bedrooms and 7,900 square feet of living space. The house’s facade and gardens were the backdrop for television’s The Beverly Hillbillies comedy. Grounds: About 13 acres with a tree-lined drive, pool, tennis court, fountain, and extensive formal gardens. The biggest lawn covers about a quarter of an acre, aerial photos indicate. Half an acre is planted in vineyards. Water use: Between 6.1 million and 12.3 million gallons per year, according to our estimates. Perenchio didn’t respond to an email describing our findings. When we called in April, a Perenchio assistant said, “We don’t comment on anything.” A satellite photo shot in July showed that some of Perenchio’s lawns had turned brown since the spring, suggesting a decrease in irrigation. Owner: A corporation is listed, but investment banker Gary Winnick is registered to vote there and is identified in news accounts as the house’s owner. A former coworker of junk bond king Michael Milken at the Drexel Burnham Lambert investment bank, Winnick later set up his own bank, now called Winnick & Co. In 1997, he founded Global Crossing Ltd., which hoped to link the U.S. to the world with undersea fiber optic cables. In 1999, the Los Angeles Business Journal said Winnick was the richest person in the city. But Global Crossing collapsed in 2002, and Winnick helped pay a $324 million legal settlement to investors and employees who claimed fraud. House: A 64-room Georgian mansion also known as “Bellagio House,” it is the former home of hotelier Conrad Hilton. The mansion is perhaps “the finest home west of the Mississippi,” the Los Angeles Times once wrote. Built in 1938 and extensively renovated in the 1990s, it has seven bedrooms, 20 baths, a pool house, a 15-car garage, and a grand terrace with fountain. In 2000, it sold for $94 million; it was reportedly listed in 2013 for $225 million, but went unsold. Grounds: About eight acres on a hill above the Bel-Air Country Club. In the 1990s, it was abloom with 40,000 flowers, the L.A. Times wrote. There’s also a pool, tennis and basketball courts, and a putting green. From the air, its lawns appear significantly greener than the nearby golf course fairways. Water use: Between 4.6 million and 9.3 million gallons of water per year. Winnick did not respond to an email and follow-up phone call. Owner: Trusts associated with film and sports impresario Howard Peter Guber. CEO of Mandalay Entertainment, he produced The Color Purple, Batman, and other hit films. With Magic Johnson and other investors, he bought the baseball Dodgers out of bankruptcy. As co-owner of the Warriors, he has pushed to move the basketball team from Oakland to San Francisco. House: The former residence of actress Mary Tyler Moore, it has four bedrooms and 14,000 square feet of interior space. Also on the property is the 2,700-square-foot “Yoga House,” a studio for Guber’s wife, Tara. Water use: Between 2.8 million and 5.5 million gallons of water per year. In response to an email, a Guber spokesperson telephoned and asked for details of our findings. He offered no comment. Owner: A trust for Nancy Walton Laurie, an heiress to the Wal-Mart fortune. Forbes magazine puts her net worth at $4.5 billion. She and her husband are the former owners of the St. Louis Blues professional hockey team. They also own a Missouri bank, an 18,000-square-foot mansion near Las Vegas, and a “super yacht” that the Daily Mail says is worth $200 million. House: Six bedrooms, four baths, and 8,500 square feet of interior space, according to Zillow. Built in 1958, it sold in 2001 for $20 million. Grounds: About five acres with a pool, tennis court, and half-acre lawn surrounded by trees. The house is adjacent to the controversial “Starship Enterprise” house, a 30,000-square-foot “giga-mansion” that developer Mohamed Hadid is building, to the distress of his neighbors. Laurie sued Hadid for damaging one of her eucalyptus trees during construction. Other neighbors, including actress Jennifer Aniston, also have complained about the project. Water use: Between 2.3 million and 4.6 million gallons of water per year. A lawyer for Laurie didn’t respond to an email and phone calls. Owners: Robert Daly, former chair of both Warner Brothers and the Los Angeles Dodgers, and songwriter Carole Bayer Sager (“That’s What Friends are For”), winner of both a Grammy and an Academy Award. House: A Georgian-style mansion with 11 bedrooms, eight baths and 11,600 square feet of interior space, according to Zillow; it has a 500-foot-long driveway and views of both the city and the Pacific Ocean. In 1998, at the height of the Monica Lewinsky scandal, President Bill Clinton attended a fundraiser at the house, and singer Barbra Streisand gave a “passionate defense” of the embattled president, the San Francisco Chronicle reported. Grounds: The house is on a heavily wooded, four-acre hilltop with a pool shaped like a half-moon. A central lawn covers about half an acre. Water use: Between 2.1 million and 4.2 million gallons per year. As the drought worsened, Daly said he has replaced lawns with artificial turf and pebbles. Since 2014, he said, his usage has dropped 35 percent. Owner: A corporation associated with entrepreneur Beny Alagem, a founder of Packard Bell computers and owner of the Beverly Hilton. Alagem is building a new hotel, the Beverly Hills Waldorf Astoria, next door to the Beverly Hilton. House: The 45,000-square-foot mansion, designed by famed architect Robert A.M. Stern and built in 2006, is the 49th-largest house in the U.S., according to the World Heritage Encyclopedia. Grounds: About three acres with three fountains, an oval swimming pool, formal gardens, and a lawn measuring nearly half an acre. Water use: Between 2 million and 4 million gallons per year. Alagem’s spokesperson said he is stepping up his conservation efforts. “We take your report very seriously,” she said in a phone interview. Owners: Soap opera producer Bradley Bell and Colleen Bell, Democratic Party fund-raiser and U.S. ambassador to Hungary. Bradley Bell is executive producer of The Bold and the Beautiful, perhaps the world’s most popular daytime TV drama. Colleen Bell is a former TV producer who raised $600,000 for President Obama’s reelection campaign, records show. Obama attended a 2012 fundraiser at their home and later named Colleen Bell ambassador to Hungary. Republicans opposed the nomination, saying she had little knowledge of Hungary. House: The 10-bedroom Spanish Colonial Revival mansion was featured on the cover of the 2008 book The Legendary Estates of Beverly Hills. Built in 1926 for a silent film actor, it was the home of rock star Rod Stewart in the 1980s. Grounds: The five-acre hilltop property incorporates the former estate of actor Gregory Peck, although Peck’s home has been razed. The compound features a tree-lined lawn, palm trees, formal gardens and what Architectural Digest called “the estate’s pièce de résistance”: an artificial waterfall that in three sections cascades down a steep hillside. Water use: Landscaping would need between 2 million and 3.9 million gallons of water per year, according to estimates. The estimate doesn’t account for the waterfall. Through a spokesperson, Bradley Bell declined to comment. Despite a wet winter that eased the five-year drought, California still faces the prospect of water shortages. That’s why the issue of excessive residential water use is important. “Outdoor use of drinking water can be one of the most wasteful practices there is,” said Tracy Quinn, policy analyst at the Natural Resources Defense Council. There’s no good reason for allowing homeowners to pump unlimited amounts, she said. In the original story in October 2015, we reported that the 25 biggest known residential water users in the state were in wealthy neighborhoods of Los Angeles’ Westside. Bel Air, an enclave of wealth and celebrity, was the home not just of the state’s largest known residential water customer, but of four of California’s top five. Over a 12-month period ending April 1, 2015, their usage ranged from 7.4 million to 11.8 million gallons per year. An ordinary California family uses about 132,000 gallons per year. Citing privacy concerns, the city refused to make their names public. At the same time, the city’s tough water conservation law imposes hefty fines for such minor offenses as watering lawns on the wrong day of the week and publicizes the names of those violators. The story prompted outrage in and outside Los Angeles. One group of residents took up what Los Angeles Times columnist Steve Lopez called a “drought posse” to roam Bel Air’s roads looking for the elusive Wet Prince. Their grassroots effort was in vain. Instead it took a few fancy digital tools, and quite a bit of math, to sleuth it out. We began by identifying large properties in Bel Air where landscaping is exceptionally lush and green. That’s one sign of heavy water use. To do that, we obtained from the U.S. Department of Agriculture specialized aerial photographs of the area shot on May 14 and 15, 2014, the most recent available at high resolution. The images were multispectral, meaning they depict light from wavelengths invisible to the human eye. 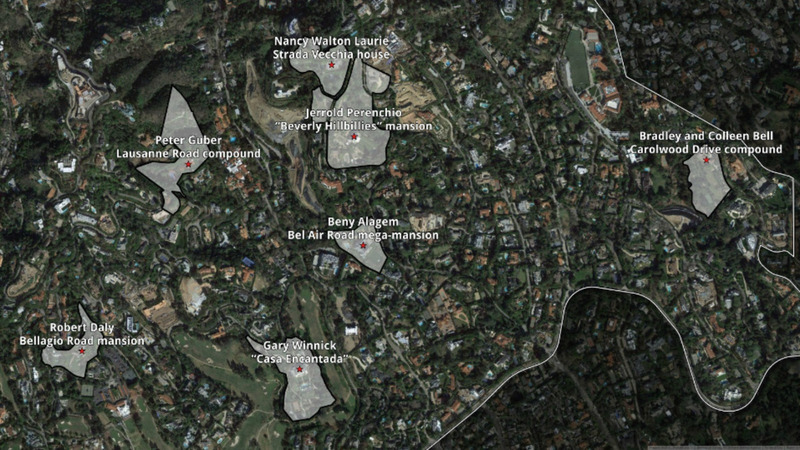 To identify individual properties, we overlaid a Bel Air real estate parcel map. ATTOM Data Solutions, a real estate data service, provided us with property ownership information. Then we used an algorithm called the Normalized Difference Vegetation Index, or NDVI, to single out those properties where plant life was particularly healthy. Scientists use NDVI calculations to assess the density of the earth’s green vegetation. The index measures a side effect of photosynthesis: Healthy plants typically reflect more near-infrared light than red light compared to plants that are drought-stressed. We then calculated the median NDVI for each parcel in Bel Air, noting big properties with particularly lush landscaping. We subtracted the footprints of buildings to make sure we measured only the landscaped area, not the entire lot. We weren’t satisfied with just one measurement so we used a second technique to pinpoint heavy irrigation: the relative wetness of the soil. This technique, called the “tasseled cap transformation,” was developed by scientists to track the moisture levels of soils from space. We used multispectral photographs taken between the dates used in the original Wet Prince story – April 1, 2014, and April 1, 2015 – by NASA’s Landsat 8 satellite to compute what’s known as a median “tasseled cap wetness” value for each Bel Air parcel. Combined, that information allowed us to zero in on the biggest Bel Air estates that scored highest for both healthy vegetation and especially wet soil. But different types of landscaping require different amounts of water to stay green, so we still couldn’t tell how much water was being used on those properties. Fortunately, horticultural experts have developed a way to deal with that problem. The Simplified Landscape Irrigation Demand Estimation – known as SLIDE – takes into account that grass, for example, requires more water than woody shrubs. We used mapping software to measure the area of each property that was devoted to grass, trees or shrubs that appeared to require irrigation. Then we put each area through the SLIDE Rules, if you’ll pardon the creators’ pun, to estimate the minimum and maximum amounts of water needed to irrigate the property. These estimates do not include water pumped for swimming pools, fountains, or household use. We knew this was a novel use for these different technologies and calculations – one borne of necessity since L.A. city officials wouldn’t help us out. So we ran it by three experts in remote sensing – that’s analyzing data from aerial images. They all said what we did checked out.